When Radiant Orchid was named Pantone's 2014 Color of the Year, it unleashed the inner purple lover in me. I've always loved cool colors like green, blue and purple, but for the last fifteen years I've swayed more toward green or teal. 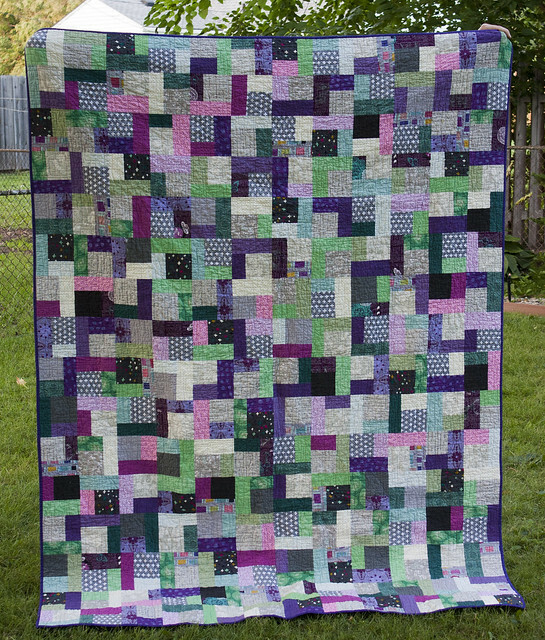 I've fully embraced my love of all things purple again this year and this quilt is no different. 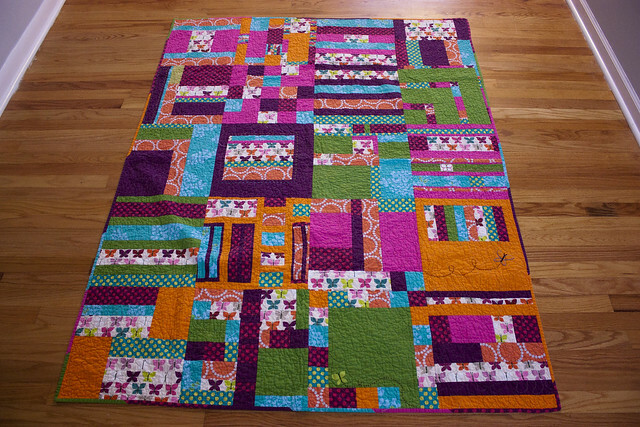 My 7th grade self would totally go crazy for this quilt! This quilt came together super fast. 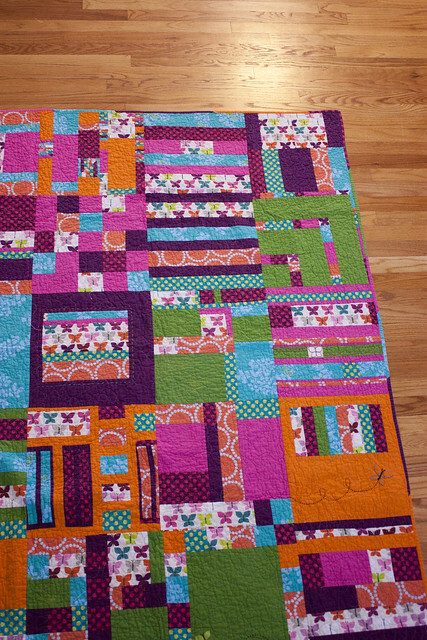 To recap my WIP Wednesday post, I used Rossie's tutorial (seen here) for quartered log cabins. The centers of each square started at 8"x8", the top and bottom strips were 3"x8" and the left and right strips were 3"x13". For this quilt, I made 48 large cabins and then cut them each into 4 different 6"x6" quarters (196 final blocks). I used up most of 24 different fat quarters for this quilt coming in at a final size of 66"x88". 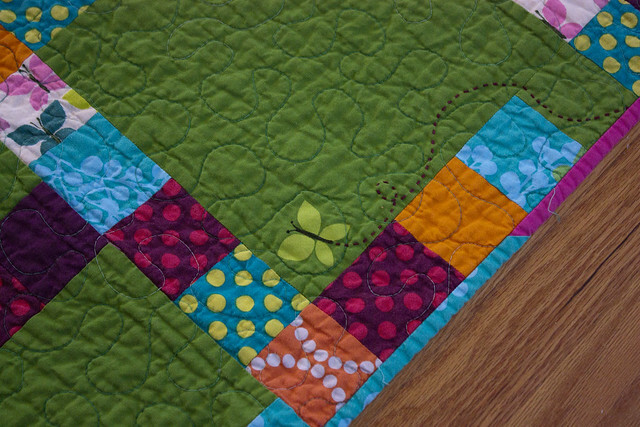 I quilted this with free motion squares after being inspired by Angela Walter's craftsy class, Machine Quilting: Small Changes, Big Variety. In her class, she emphasized that it's best not to fret over how each tiny stitch looks and to use blending thread so that every seemingly huge mistake is less noticeable. 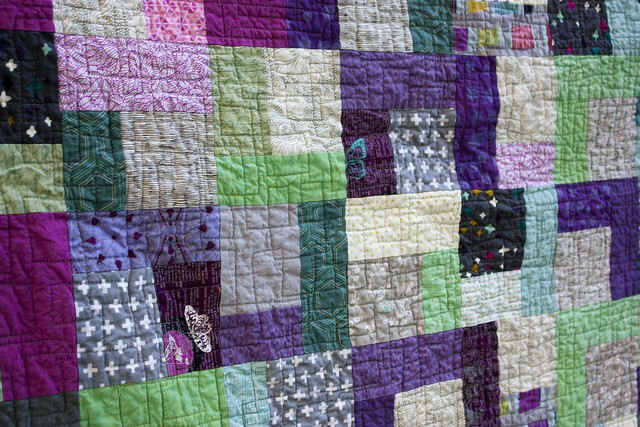 While the quilting has lots and lots of mistakes in it, the overall organic look of the overlapping squares really shows through the errors I made and I love how it turned out. It's great to have another quilting technique in my arsenal, too! 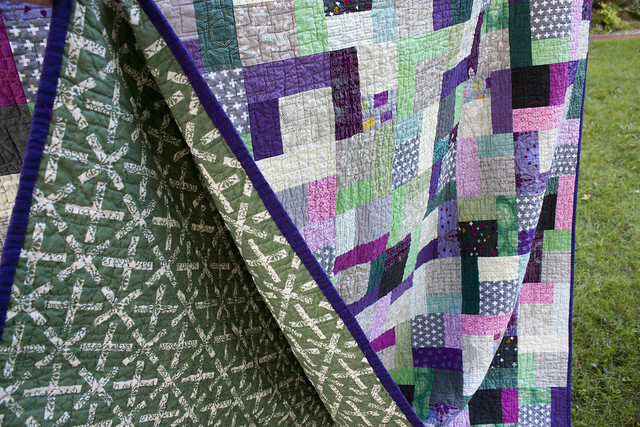 The drape of this quilt is one of my favorite parts. I've been using Pellon Nature's Touch batting for all of my quilts and I really like the thickness of the cotton. 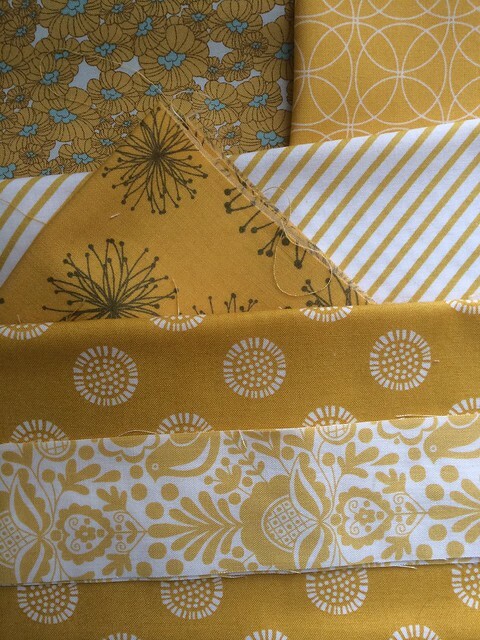 The hand of the Andover Alison Glass Sun print backing fabric and the peppered cottons are fantastic too. 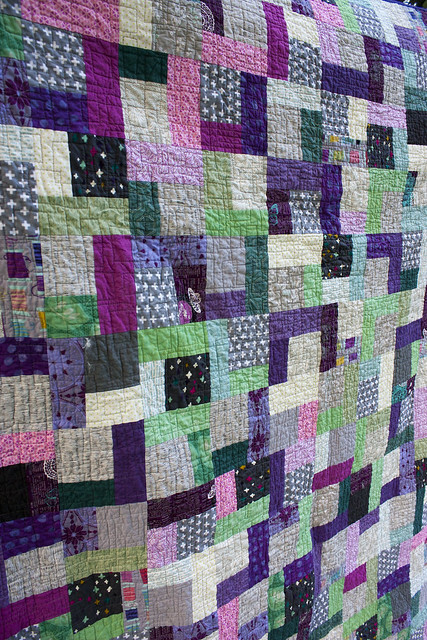 I think those two factors, combined with the denser quilting, really created a soft and vintage feeling quilt. I'm debating what to do with this quilt. I love it, but we're reaching quilt capacity in our house, so I think it's going in the gift pile for now. I may need to live with it for a few more months before I can part with it, though. 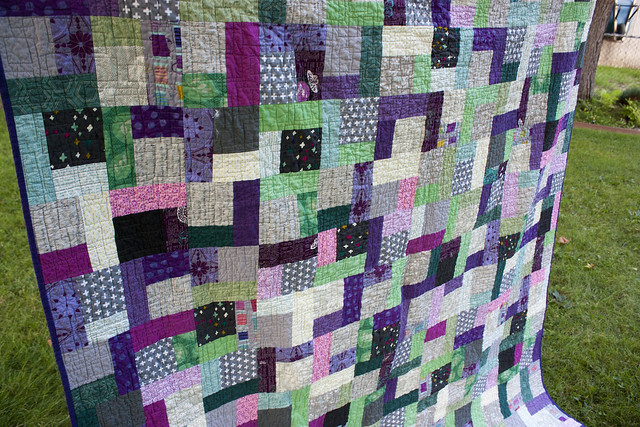 Back in 2008-2010, I participated in the Common Threads Quilting Bee. I never got around to posting about my second finished quilt due to my two year blogging hiatus, so here it is! 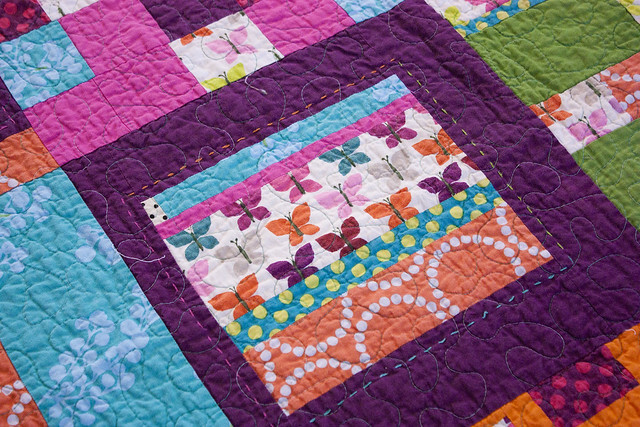 Looking over my instructions post from November 2010, I see that I requested patchwork blocks with right angles and sent out a selection of prints and solids that coordinate with this butterfly print. I loved receiving so many unique and creative blocks! 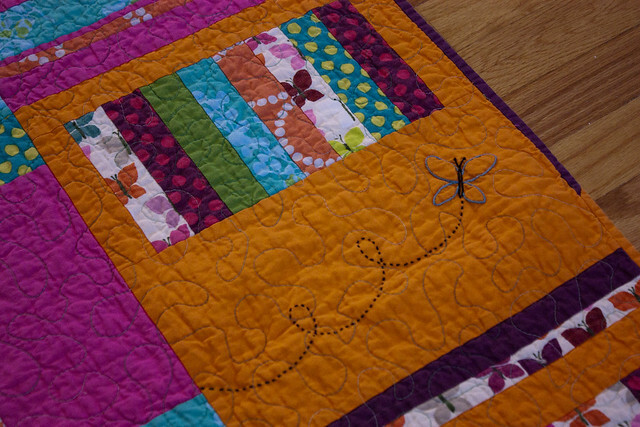 I never would have thought to embroider a butterfly or use fabric paint to stencil a matching butterfly onto the block! The finished quilt is 58" x 72" inches and has a scrappy binding. This is one of my favorite quilts and is in constant rotation in our tv room. Every time I pull it out, I notice another fun detail in the quilt. 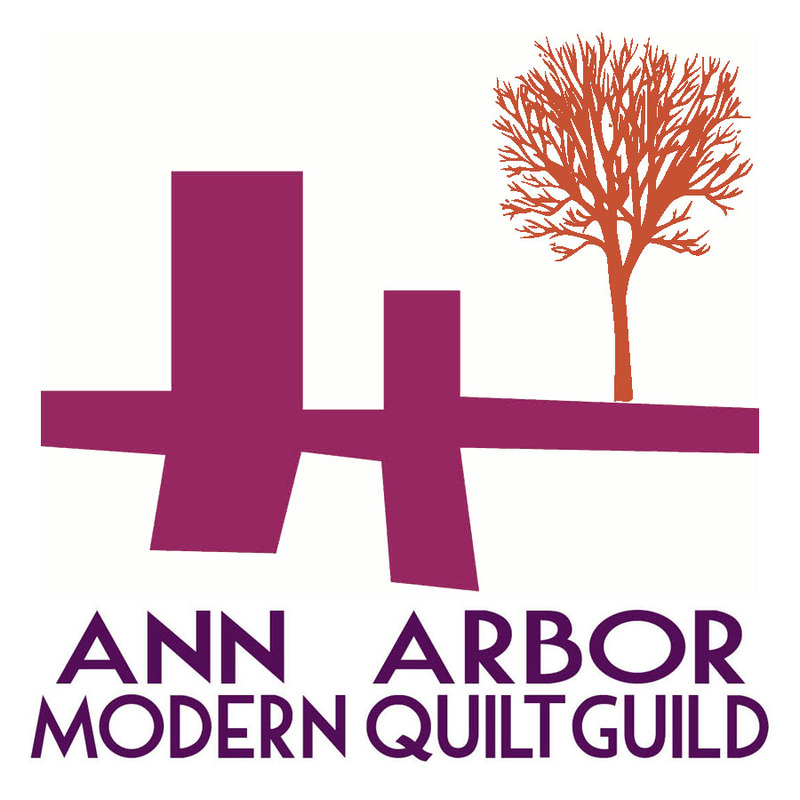 I think these online quilting bees are a quilt blog thing of the past, but my modern quilt guild chapter does do a round robin each month. I'm considering putting some fabric together and joining in later this month, but first I need to come up with a fun concept! Each summer, my aunt and uncle host my grandma's extended family at their lake house in northern Michigan. As a thank you to them for opening up their home to a 40-50 relatives each year, I decided to make them a quilt. My aunt is an exceptional seamstress. She has made all of the drapes and many of the pillows in her home and has sewn beautiful clothing for herself. When I was just out of college and moving into my first apartment, she helped to spark sewing interest in me by letting me borrow her sewing machine to sew curtains. I have always been quite intimidated to sew anything for her because of her amazing attention to detail and skill level. 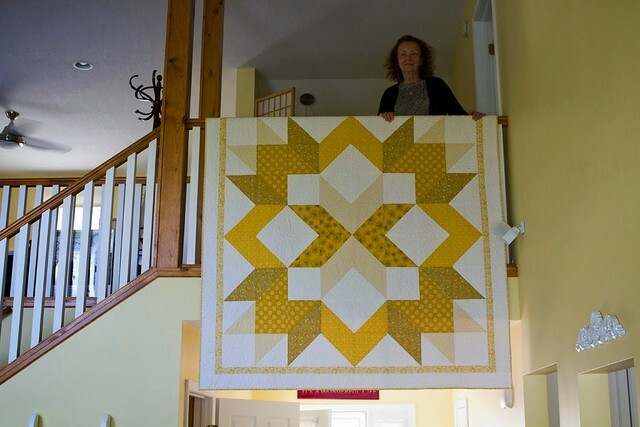 Once I got over my hangups, I ordered a selection of yellow fabrics to match her home and then let them sit in a pretty stack for a few months while I waited to settle on a pattern. I wanted to start with a traditional pattern to match her tastes and thought about enlarging this star pattern to make a one block quilt. After I realized that the white square in the middle would be the most predominant piece showing when the quilt is folded up on her couch, I decided to table that idea. Then I discovered the Designer Star pattern and this gorgeous version of it on from the blue chair and knew it was the perfect pattern. 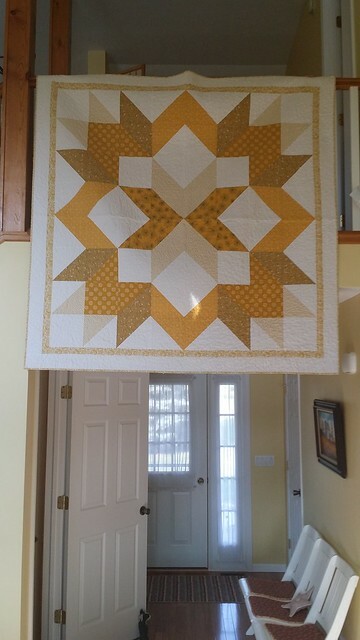 The finished quilt is 72" square and uses a combination of yellow prints. I stippled the quilt and finished sewing on the binding with about one hour left before we had to leave for the family reunion. My aunt started crying when she saw the bag it was in and it took her a few minutes to even open it up and look at the entire quilt. She told me that she's always wanted one of my quilts but didn't want to ask me to make her one. It was so sweet and moving to receive such a huge reaction like that. She and my uncle have been so supportive of me through the years that it was the least I could do to reciprocate her generosity.